Here's to another great year with lots of new construction homes and remodels. I know it sounds cliche but the kitchen is the heart of most people's home and as such a lot of attention to detail should be going into it. When you embark on a remodel or you build a whole new home, the kitchen is probably were you invest your most. We hope this blog will inspire you to create a great kitchen that makes you and your family happy. Good design can have a huge influence on your well being and mood, and besides the functional aspects that every kitchen needs to serve for any particular family, that's what we focus on the most: what makes people happy in their home and what helps them to relax and live a good life. Some of the trends described below might be completely new and just on the rise; others might be "old" but still going strong, which all depends on the area you live as well. Enjoy reading and always feel free to contact us with any design questions. 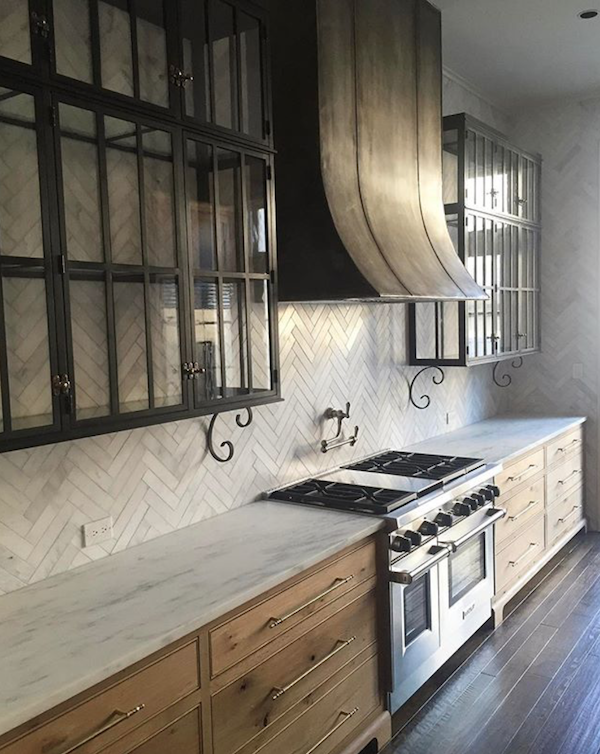 This kitchen designed by Joel Kelly Designs features grey oak cabinets, which were lime-washed to highlight the wood grain and to give it a cerused appearance. Quarzite tops the counters and bookends the island base. This blueish-grey is a beautiful contrast to the brown chevron hardwood floors (another big trend). The leathered finish of the quartzite has a subtle patina and is an ease care finish material. LOVE! Custom steel doors are always a winner and a huge classic! I am so glad this is big again. I especially love it for the pantry. Don't you love that bridge faucet, too?! We see in general less upper cabinets. Open steel shelving is big new trend in the custom sector. You can also choose shelving (wood or any other material) in front of windows, which allows great freedom with your windows and other architectural elements. Something you can probably see in almost all of the pictures posted in this blog - that's how much of a trend it is right now. 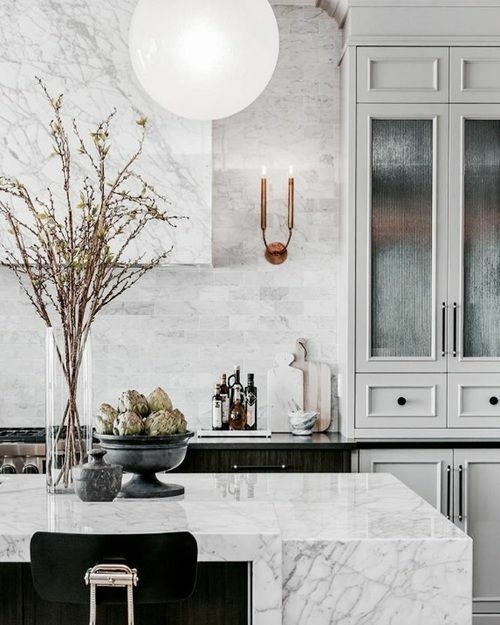 It's such a clean look and if you're going with a stone that naturally has a lo of veining, the waterfall really adds to the dramatic look of it all. We highly recommend! White is a great color - don't get me wrong - but let's change it up. Even a little off-white color can do the trick or combine two colors. We see more interesting materials and textures in kitchens and baths. Moving away from white is not quite as safe of course, and the coordination of materials takes skill and a good eye but the outcome is totally worth it. Here's an example of a super wide vent hood with no wall cabinets - this a new clean look that is becoming more and more popular in today's modern and traditional kitchens. Statement hoods in all shapes and materials are on the rise. This utilitarian kitchen element is gaining center stage with the range nowadays. Following the idea of giving the vent hood more space in general, another design element we like to use more often now is placing sconces next to the hood and extending the backsplash all the way up to the ceiling.